... and Dunfermline have got Bruce Anderson from Aberdeen ... losing George smacks of small short-term monetary gain and next to no genuine aspiration to leave the Championship. Oh dear - Gorgeous George gone and, now the nerds find the %s to justify. Why? act The ladies are bereft that gorgeous George is with Hamilton. Will the ladies follow Hamilton? Time will tell. No, Lizi, they won't. George is off to follow his hero, Douglas. Recently arrived is Darren. Although I was at Falkirk on Saturday, I can't attest to how gorgeous or otherwise Darren is. Darren, however, will attract the ladies (and other women, and some men) using his abilities to score goals and provide assists. Don't love George, love Darren (and all those other boys, all the way back to Cammy). Cammy will probably know when he's going to play before the team lines are published from now on, so may start with a bit more confidence. 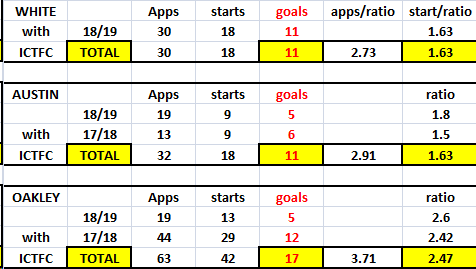 What is more telling is the importance of goals and how many points they have won - a player may only score 5 goals but each may the solitary strike per game resulting in 3 points where as another may score 10 but 3 of those were hat-tricks. Just trying to emphaise while your stats are interesting they are like any statistic only aimed to present a certain perspective based on the desired outcome of the creator and are therefore not always the only benchmark - there are no figures for assists which are an aspect of Oakleys game given he and Austin played as a partnership. Correct no assists stats . George obviously saw his future elsewhere , was just pointing out that the two strikers left have more goals in them than Oakley. So it’s not all doom and gloom . Was interesting to read bdu98196 thoughts on stats and do appreciate that goals may or not be critical in gaining points. So had a look at 3 strikers goals that we have gained points from, otherwise if they hadn’t scored in the game we would be these points worse off in the league. That wasn't even close to happening. Any way up, he's off all the best and all that guff but let's get behind what we have and see if we can't be there come the play offs? Three important ones - Partick the morn, Gadgies and then an away day at The Pars and 3 wins would be lovely thank you. Good luck to you George, hope you do well at Hamilton, thanks for your contribution here. Certainly echo that. You definitely have the potential to do well and your bustling all action style should suit Hamilton. However, you have a real dog fight at the bottom of the SPFL. I'm sure the club and management weighed up what small additional income we'd receive versus what he could offer on the pitch and decided to take what little we could. Not knowing the full story behind why we accepted the offer, possibly he signaled his intent privately that he wasn't going to renew his contract. If it covers a week or two's wages then it's decent business, yes that sounds grim reading it back but if that's the level we are currently at then so be it. We've had bigger players leave in the past and survived and will again, no player is bigger than any club and one out is another players opportunity. Until Robbo pulls the shirt back on to play up front I won't be worrying. Anyway with the kind of players we are attracting to the club we may well look to bring in a free agent. We should now be able to afford to turn on the under-soil heating to ensure the game goes ahead tomorrow. I fear he will be overwhelmed by the Premiership atmosphere and massive crowds at New Douglas Park. The fact that players see moving to Accies from us as a step up is hardly a laughing matter and is a sad indictment of where we are these days. Or it could be tasting Premiership football, better pay and Central Scotland ? So very true, cannot believe the 'undisclosed' transfer fee was any where near a true valuation for a decent young player. Decent player, very patchy injury record...I don't care if the stats say otherwise but the plastic at NDP will not do him any favours in that respect. Plastic pitches have no place on our top league and maybe should be banned in championship too so I totally ageee with you. Scores his first goal for Hamilton tonight! We'll deal with him/them in the playoffs. And he has just scored a second goal! Maybe he likes the rubber pitch. Maybe getting better quality service, guess we will see by the end of the season but perhaps it's not the stats that suggest out or forwards are guff but the lack of quality around them?